Some types of “artisan” bread, for example Italian bread loaves, are first proofed in an oven to cause the dough to rise and then are “scored” on top to create a split in the dough that when baked adds a pleasing crunchiness to the bread. Scoring has been done by a baker with a knife, for centuries. For bread made in small restaurant scale, this is a simple process that a baker can do in seconds with little trouble. But on the scale of a commercial bakery baking thousands of loaves of bread per day for the restaurant or retail grocery industries, the repetitious knife scoring of bread loaves leads to overuse injuries by workers and possibly carelessness resulting in cut fingers or hands. Cuts will cause product line downtime for cleanup, results in safety inspections and worker injury claims. Altogether, such costs can mount to the hundred thousands of $ dollars. Product quality and consistency, worker overuse injuries, the lack of quality labour, and missed baking time windows in zonal oven loading were key problems Tech Brew’s first system was designed to relieve. Technology Brewing in Salmon Arm, BC (http://techbrew.com/BreadScoringRobot.html) designed a bakery robot system using a Kawasaki robot (https://robotics.kawasaki.com). The scoring robot automatically scores randomly positioned loaves with an ultrasonic knife according to user defined products. The robot locates proofed bread dough using 3D machine vision technology housed in a food safe enclosure. Knowing the exact location and 3 dimensional geometry of each loaf means that this robot can score relative to the top surface of each loaf at the exact desired score location and angle. It actually follows the curvature of the dough. easy to use, and can be quickly installed to minimize production downtime. It comes with installation support and remote support features for those rare times that technical help is required. This system has a fast payback for most wholesale bakeries because of its high and consistent throughput combined with high work quality and resulting product consistency, all while reducing labor cost. 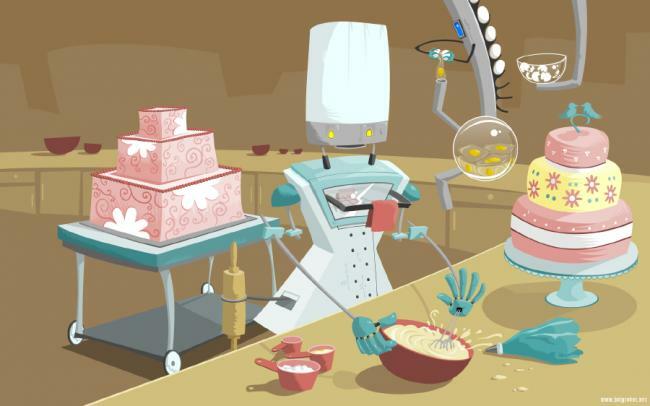 Note that robots operate 24/7 so a robot bread scoring system will replace 3 or more workers for a commercial bakery operating 24 hours a day.